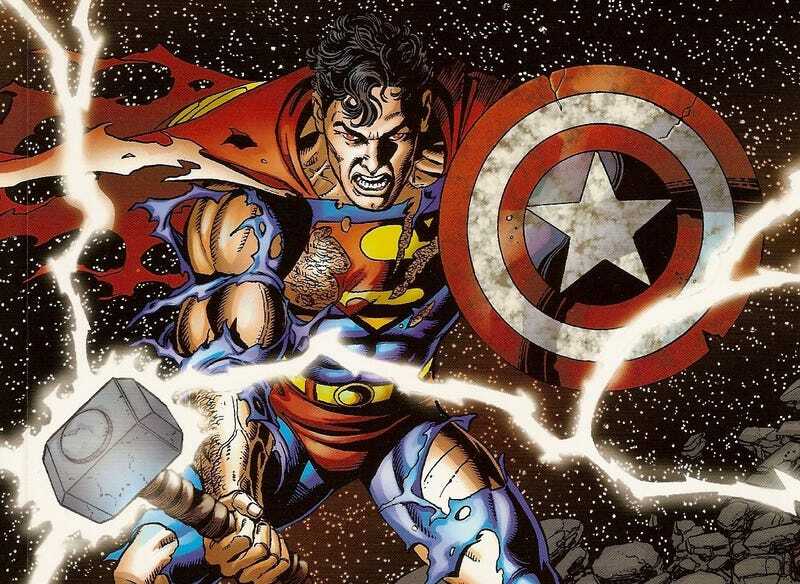 The Man of Steel wields two of Marvel Comics’ most powerful weapons on the cover of Avengers/JLA #4. When George Perez announced his retirement a few weeks ago, the unanimous consensus was that the light across multiple fictional universes got significantly dimmer. Perez’s name is synonymous with cosmic-level happenings. His covers and interior artwork for projects like Crisis on Infinite Earths, Infinity Gauntlet, Wonder Woman, and Who’s Who in the DC Universe offered up a dizzying panoply of the excitements awaiting readers picking up those comics. But Perez’s oeuvre really stands out because he could deftly switch from intensely detailed panoramas to highly charged interpersonal intimacies. Take a classic like “Who Is Donna Troy?” It’s not a multiverse-altering event, just a quieter story where one friend helps another learn about their past. Every hug, bitten lip, and tear-streaked face resonates in exactly the way it should, squeezing maximum emotion from the reader. The melodrama on this page from New Teen Titans #38 is Peak Perez. On the opposite end of the spectrum is JLA/Avengers a miniseries—done in partnership with writer Kurt Busiek and colorist Tom Smith—that represents a Herculean effort on Perez’ part. Perez’ work on the series exceeds expectations and an encyclopedic parade of characters from every era of Marvel and DC’s continuities marches through the project’s pages. But more impressive than that is how Perez executes it. Look at the cover for issue #3. A comic cover that practically compels you to get lost in it. The pairings of heroes from the rival companies are layered with winks and nods to the history of the medium. Some of them are obvious, like having two Captain Marvels—Billy Batson and Monica Rambeau—flying next to each other. In the lower left, you see the Flash of the Golden Age running alongside his counterpart the Whizzer and Jesse Quick, daughter of WWII-era super-speedster Johnny Quick. Other choices come across as more subliminal. When Perez puts Machine Man and Blue Beetle up against each other, you might remember that they were both drawn by the legendary Steve Ditko. This maximalism comes across a testament to the work that it took to birth whole dimensions and entire lives. Perez always seemed to honor those that came before him, yet his draftsmanship, camera angles, staging, and spacing were uniquely his own, too. In many ways, Perez was the perfect artist for the ‘70s and ‘80s. Perez broke in just as the ambition and scale of storytelling in superhero comics were shifting into a more melodramatic mode. Writers and editors were leaning on long-simmering subplots and deeper character dynamics, resulting in stories that had a wider scope than ever before. Though he laid incredible amounts of detail into every piece he ever drew, it never felt superfluous. Just by looking at this image, you just knew that this was an event that would pull together disparate corners of the Marvel Universe in an awe-inspiring way. The reflective sheen of Terra’s lip gloss makes her betrayal of the Teen Titans in The Judas Contract storyline feel even more hurtful. The menacing lasers of light segmenting the cover of Infinity Gauntlet #1 foreshadow a reality that’s about to be broken apart. All those lines from Perez’ pencils and pens communicate the complexity of the comics-making endeavor, as well as the majesty and mundanity of the universes he worked in. George Perez was always an artist who gave his all and—as he embarks on a retirement where he might actually get to rest and enjoy how his co-creations show up in TV shows and movies—we can only hope that he gets as much back from comics as he put in. What if the Marvel vs. DC insanity of the Amalgam Universe never ended?